Writing about the past – a project you’ve completed, an experience you want to share in a blog post, or a professional accomplishment – is supposed to be easy. So why do you sometimes get confused about whether you need to add “had” to your past tense sentence? That is, why is it hard to figure out whether to write “I had called him about the invoice” vs. “I called him about the invoice”? In this post, we’re going to talk about when to use “had” when talking about the past. To talk about when to use “had,” we need to talk about verb tenses. We know that verb tenses aren’t the most riveting of topics, so we’ll try to make this as bearable as possible. And to do this, we’ll focus on just two verb tenses: past perfect tense and simple perfect tense (what you think of as regular past tense). As this sentence shows, we write verbs in the past perfect tense by attaching “had” to the regular past tense version of the main verb (i.e., “called”). And when do we use the past perfect tense? When we’re talking about an event in the past that happened before a more recent past event. The example sentence above says that two things happened: (1) I called Matt about the invoice, and (2) we received the cheque. But these two events didn’t happen at the same time. Instead, I first called Matt. And then at some point after I did that, the cheque arrived. When you need to talk about two things that happened in the past and one event started and finished before the other one started, place “had” before the main verb for the event that happened first. 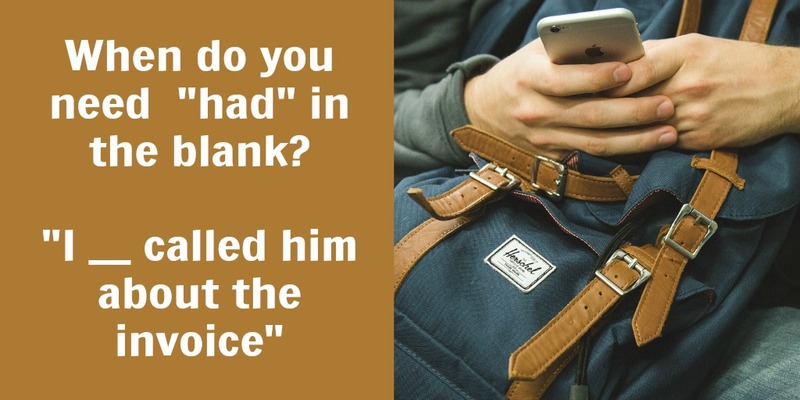 We’ve talked about when we need to include “had” before the main verb in a sentence. But when do we need to leave it out? We don’t need to use “had” in a sentence when we’re using regular past sentence (also called simple past tense). That is, we don’t need to use “had” if we’re referring to a single event in the past. This sentence describes just one event in the past – receiving the cheque in the mail. So all we need to do is place the main verb (“receive”) in past tense. We don’t need to add “had” or any other helping verb to the sentence. Up until now, the use of “had” before the main verb in a sentence may have seemed arbitrary. But now you know that there’s a simple rule that tells us when to use “had” and when to leave it out. Are you talking about two events in the past and one took place before the other? Use “had” to describe the first event. Are you keeping things simple and just talking about one event in the past? Keep “had” out.